What Does "Wealth Management" Even Mean? There are certain titles in the financial advisory business which require a license to use (Registered Investment Advisor being one), but for the most part, financial advisors can call themselves whatever they want, including “financial advisor”. There is no legal or regulatory standard by which an advisor or broker can call themselves a “financial planner” or “financial consultant”. The same is true of firms, which can promote its services through the use of any number of nebulous words, including the seemingly all-encompassing term “Wealth Management”. What does “wealth management” mean? When an advisor or a firm says it offers wealth management, what services are they actually promising? More importantly, what services are they not offering? 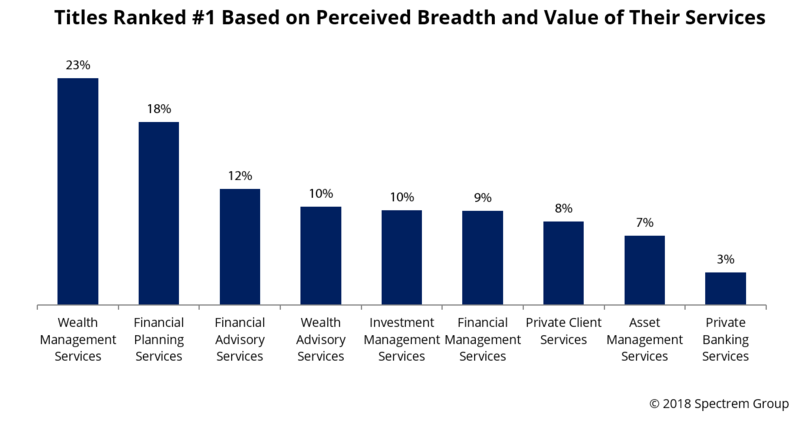 All of those questions are asked in Spectrem’s new study Defining Wealth Management. The study does not define wealth management (the industry itself cannot define it). Rather, it determines just what investors think “wealth management’’ means, and what it does not mean. As a term, "wealth management" is perhaps the most influential in attracting clients. The survey asked to select the phrase which promises the greatest breadth and value of services, and 23 percent of investors with a net worth of $100,000 or more selected Wealth Management Services, by far the most popular response. Financial Planning Services received 18 percent of the No. 1 votes. To show how confusing the industry terminology is, five different phrases were considered the strongest term by at least 10 percent of investors. Since the phrases hold no true definition, they are just marketing terms used for the emotional response they invoke. Of the investors surveyed, 60 percent said they had a financial advisor, and 36 percent of all investors (and more than half of those with a financial advisor) said they receive “wealth management” from their advisor. The study also examines perceptions of investors who could most benefit from wealth management services, determining just how wealthy an investor needs to be to require someone who offers wealth management services. This is more than just a conversation about marketing terminology. Investors have a very strong opinion about what they believe “wealth management" means, and are likely to have expectations based on the use of that term. If the reality does not match the expectation, investors are not going to be pleased.